Need a place to crash in Sydney? Whether you're planning on a cheeky getaway with bae, a break with the squad or hitting it solo (cos why not! 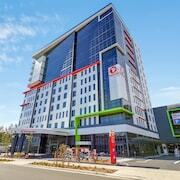 ), you'll find plenty of amazing hotels on lastminute.com.au. Want to be based in the middle of the action? No probs. You can choose from a whopping 201 hotels within 2 kilometres of the city centre. Don't get FOMO — stay near the action at the Park Hyatt Sydney and the Pullman Quay Grand Sydney Harbour. We wouldn't be doing a very good job if we didn't also recommend The Darling at the Star and the Quay West Suites Sydney. Sydney Central Business District, located only 0.3 kilometres from the heart of the city, is a prominent neighbourhood with 62 hotel options. 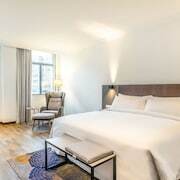 See what you think of the Establishment Hotel and Zara Tower - Luxury Suites and Apartments. Massive sightseer or chilled-out globetrotter, Sydney Opera House ought to be on your bucket list! The InterContinental Sydney and ADGE Boutique Apartment Hotel are within walking distance. Unpack your suitcase, pull out your smartphone and wander on over. The sights and atmosphere of Paddington Markets attract passersby and sightseers alike. Need a bed for the night close by? No probs, we've got you covered. Shangri-La Hotel, Sydney and QT Sydney are practically around the corner. If rooms could talk, Elizabeth Bay House would be teeming with voices of generations past. Plan a tour and learn about the local history. Luckily, The Langham, Sydney and Fraser Suites Sydney are not too far away, so you can swing by and see it as often as you'd like! Why fritter away all your cash on flashy accommodation? Choosing the budget option means you'll have more money for the fun stuff! Big Hostel and The Woolbrokers at Darling Harbour are a couple of convenient options. Some other lower-cost hotels include Manly Beachside Apartments and Western Sydney University Village- Parramatta Campus. You might also like to try the Taren Point Beach House, which is situtated 18 kilometres away. Or perhaps the Quest Manly, just a distance of 10 kilometres from Sydney. 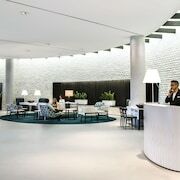 The Harbour Rocks Hotel Sydney MGallery by Sofitel, 0.9 kilometres away, and the Radisson Blu Plaza Hotel Sydney, 0.2 kilometres away, are some other options. Always on the lookout for your next great adventure? The wider New South Wales region has some incredible things to see and experience as well. Sharpen your landscape photography game by visiting some of New South Wales' stunning rural landscapes. History museums and craft workshops are a few more popular tourist stops worth whipping out your camera for. Thirsty for more? Popular things to do in this corner of Australia include snowboarding and skiing, so get out there and have a crack! After more options? Live it up like a rockstar in Edmondson Park (just try not to trash the joint). Sitting 35 kilometres away and home to TreeTop Adventure Park Sydney and Westfield Liverpool, it's sure to be a journey to remember! 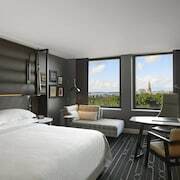 The Mercure Sydney Liverpool and Country Comfort Hunts Liverpool are some of the great apartment and hotel options here. 35 kilometres to the north of Sydney you can also stay at Patonga, home to the NRMA Ocean Beach Holiday Resort and Beachview Homestay. Whether you're just passing through or staying in Patonga, set aside a little time to check out Putty Beach and Killcare Village Shops. Ever spent a night on the hard airport floor cos you got too excited and forgot to book a hotel room? Save yourself a cricked neck and see if you can score a room at the Rydges Sydney Airport Hotel or the Mercure Sydney International Airport. 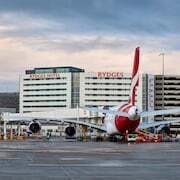 Neither are far from Kingsford Smith International Airport, which is just 9 kilometres from the centre of town.